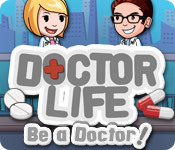 PC Games > Time Management Games > Doctor Life: Be a Doctor! Doctor Life: Be a Doctor! is rated 2.3 out of 5 by 29. Rated 5 out of 5 by Lonnieball from Amazingly different! Okay, so at first I didn't know what to expect from this game, but as soon as I figured out how it is, I loved it. This game is extremely different from your ordinary time management game, which is refreshing. There is put zero pressure on you throughout the game; you can do it as slowly or as quickly as you'd like. It doesn't require a lot of thinking, but you DO need to combine symptoms into a single diagnosis, then choose the correct treatment for that illness. It IS kind of repetitive, but you don't really find yourself finding it repetitive. Or at least, I didn't. I find this game amazing. The only thing is that you can't see your whole hospital on the screen (you can't zoom out far enough) once it gets a little big, but that does not lower the fun of this game. Overall, I love it, and I surely think you'd love it too. Rated 5 out of 5 by gabeaustin from Challenging very fun new game, lots of levels and new challenges. disease diagnosis and treatment combined with making money/expanding the hospital. play at your own pace. Rated 5 out of 5 by Geronimo76 from Yes! A fresh concept! Not your traditional time management, more simulation, puzzl-ish and definitely a speed memory game. Time management comes in when you have to treat your patients quickly to earn combo bonuses. I was initially worried that the game would be childish, but I soon realized that there was nothing childish about it aside from the graphics. 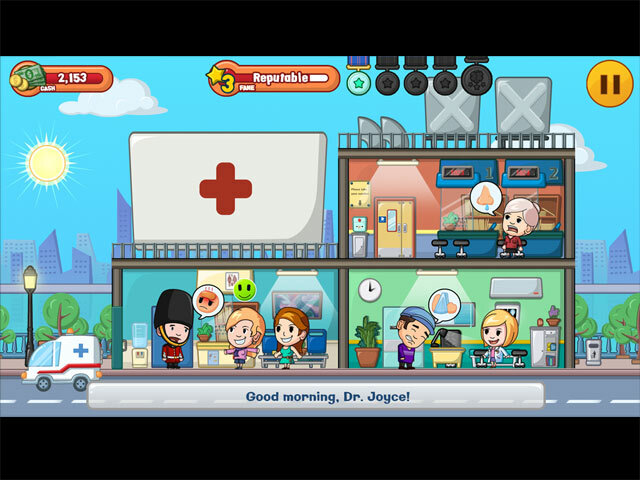 The game uses real life treatments and diseases which is something different from most games out there. Gameplay-wise, it can get quite manic at times due to the sheer number of patients, but I liked that there is no penalty for not treating all of your patients so I can take my time with each diagnosis. My daughter gave it a run as well and she's loving it. It's great that she looks up to me for the correct diagnosis and treatment! Some things I discovered that made my experience better: * Mouse wheel scroll zooms out so you don't need to pan around so much. * Keyboard controls (arrow keys) work in scrolling the scene. * The correct answer flashes so it's okay to get answers wrong - there is a learning process through it. Definitely a breath of fresh air from all the HOG games. Worth a try and if you like learning new things, you'll love it! Rated 4 out of 5 by amethyst111 from Good I enjoyed this game and finished the trial, it was a refreshing new take on the time management games and a nice change from the usual repeated style which is one reason I may decide to buy it. The title 'doctor life' though makes me think of games such as 'Magic life' and 'life quest' and as i absolutely love those type of games, i was a little disappointed to find it wasn't that kind of game. Rated 4 out of 5 by pennmom36 from Is There A Doctor In The House? This game needs to be played for about 10-15 minutes before you can appreciate it because the first few levels are tutorials and very repetitive. 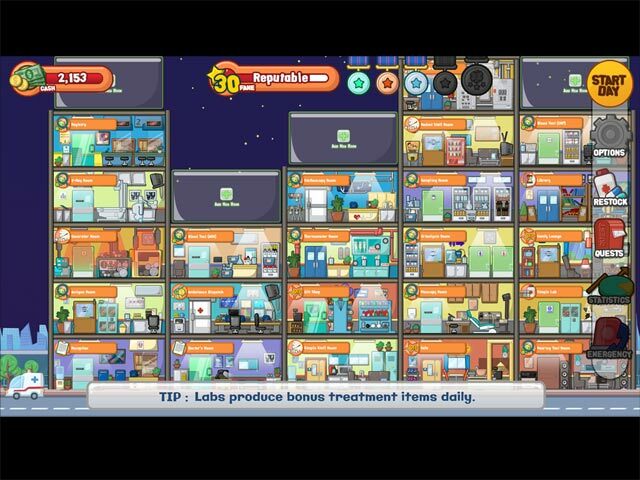 At the start of each level, you are given a quest such as adding a laboratory or diagnosis room or earning $500. Before you start the level you need to restock your supplies of ice packs, heat packs and various medications, each item cost money so you need to figure out how many items you can afford. When a patient comes in an icon will appear that indicates what the primary symptom is, such as a sprained wrist or ankle. 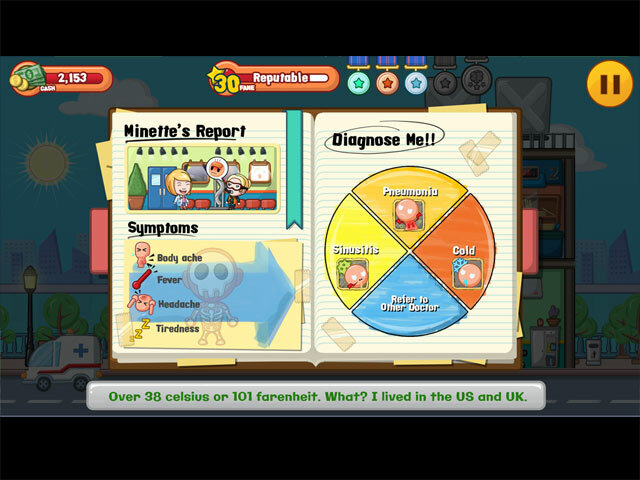 You click on the patient and a pie chart appears on the right with 4-5 possible diagnosis and all of the symptoms the patient is experiencing is on the left. You then decide what the problem is, such as a headache with a sharp pain behind the eyes, matches the diagnosis of sinusitis. You then choose which treatment to use from a list of 4 possibilities in this case nasal spray is the correct treatment. Other diagnosis options are sprains, pneumonia, colds, strep throat, myalgia and even eye sties, with treatment choices of hot and cold packs, NSAIDS, nasal sprays and paracetamol, as you progress new treatment plans become available. You start out as an unknown Doctor and earn awards that boost your neighborhood status to barely known and so forth until you become a very likeable and well known Doctor. At first glance, I really thought this would be a very boring and slow paced game but it does progress nicely and the higher the levels, the more things there are to choose from which keeps the pace interesting, so don't give up to quickly and I think you will have fun, enjoy! Rated 4 out of 5 by cele3 from A Cute Little Game! If you're looking for a fast paced game with all the bells, whistles, and buzzers, look elsewhere. If you are wanting a fun game that will fill in some time without straining your brain, this could be your cup of tea. That being said, I found this little game to be rather enjoyable. The story line is cute, and I like the style of graphics. I played about 30 minutes of the demo, and decided to buy it (using the St. Patty's Day discount). I think it's worth $5. Rated 3 out of 5 by June129 from Ok This game was ok. I played the whole hour but it wasn't quite challenging enough. I wouldn't personally buy it. Rated 3 out of 5 by wabtm from It is basically a memory game Do a quick review of the symptoms and match it to the condition. (Multiple Choice of 3). Then choose how to treat the condition (again multiple choice of 3). However, if you get it wrong first the correct answer flashes so the next time you know what the game wanted. So you just have to remember what to click. The music problem which has been noted... When you start the game and you turn off the music when you do the tutorial it turns it back on... the people who are saying that you cannot click pause or anything to turn it off. Well you have to play through the tutorial with it on as to do the tutorial you have to click only where they say to click but once that is done you can click pause, options etc and turn it off. An the tutorial is a quick 1 to 2 mins. So not really a problem. Rated 3 out of 5 by debby369 from Made for touch screens This is a pad game. It does not do well for PC's, and I can only imagine it must be worse on pads. The graphics are too big, forcing you to constantly move around to find the wandering patients, wherever they may be. And the music, please stop the music, there is no volume control, just on or off.